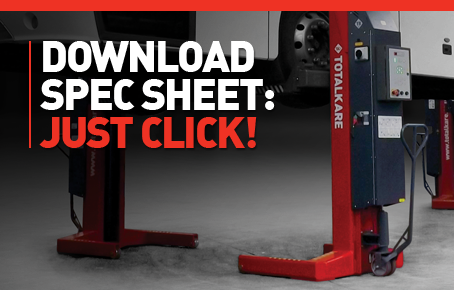 TotalKare’s latest hydraulic cable-free mobile column lifts offer the perfect solution for workshops where manoeuvrability and flexibility is required. TotalKare’s T8DC cable-free hydraulic mobile column lift makes lifting operations simple! 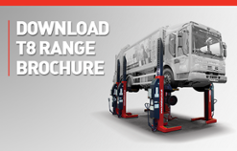 With no interconnecting cables, the T8DC is designed to be easily manoeuvred around the workshop and is an ideal lift for any commercial vehicle ranging from bus and coach through to waste and recycling vehicles and everything in between. The T8DC is charged from a 230V wall socket, has a capacity of 7,500kg per column, adjustable forks for lifting vehicles with smaller wheels and can be connected in up to eight column configurations to suit a variety of requirements.